It all began with Bishop and LaRouche, a couple of cabinetmakers turned carpenters turned undertakers. In 1897, L.B. Segur bought out John Bishop’s interest in the furniture and undertaking business, and by the next year, he’d bought out Mr. LaRouche. According to newspaper accounts, the Segur name was growing to be synonymous with quality merchandise and fair business practices. In 1899 Segur experienced a real calamity. A fire destroyed almost all of his possessions and ruined the interior of his building. He chose a temporary place to relocate until he was able to purchase the lower portion of the old Odd Fellows Hall. He was there for a number of years while eventually buying out the rest of the building. In 1928, he built the permanent quarters for the Segur Furniture and Undertaking establishment. By now, Mr. And Mrs. Segur had three sons joining them in the business, but only one, Kenny, handled the funeral home. By 1933, funeral homes were moving from back rooms of furniture stores and into quarters of their own. L.B. Segur was looking ahead when he purchased the George Keath home located at 219 South 4th St. in Watseka. Before he could complete the remodeling of the home for his mortuary, he passed away. Kenny and his brothers carried out the plans of their father in the next few years, and soon ended up with a well equipped and efficiently arranged mortuary. By 1947, the local papers were reporting that the well-designed business was being used as a model for many other funeral homes in Illinois and Indiana. In 1969, nearly forty years after Kenny had joined the business, Wayne D. Knapp bought the business and merged to form Segur-Knapp Funeral Home. Wayne had graduated from a Chicago mortuary school in 1952, worked in Europe for two years as a mobile embalmer while serving in the Army, and then came back to work in Danville. Wayne had several locations in Iroquois county at the time, and thought it would work out well to come to Watseka. At this time, Mr. Knapp was also the Iroquois County Coroner, an elected position he held for 16 years. In 1970, Knapp completed a brand new facility that still exists on the original 219 South 4th St. location. The older facility that was used for many years by the Segur family was then moved to the far western part of the lot. The business was able to remain open throughout all of the construction, in the year it took to build the new facility. In 1979, Knapp’s son, Steven W. Knapp, joined the firm after graduating from Southern Illinois University with a B.S. in Mortuary Management. And in 2007, Steve’s son, Adam J. Knapp joined the family business after graduating from Southern Illinois University with a B.S. degree in Mortuary Science and Funeral Service. There has been many upgrades and remodeling efforts done to all of the facilities over the years by the Knapp Family. In addition, many locations have been added to cover several counties, including, Iroquois, Ford, and Vermillion Counties. To have Three Generations of funeral directors working together is a rare and proud accomplishment by the Knapp Family. Knapp Funeral Homes is built on the service and care we give to our families. The firm has earned its Centennial place in the State of Illinois Historical Society. 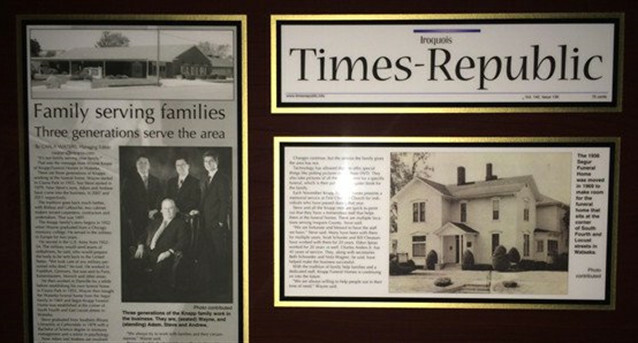 In 1997, Knapp Funeral Homes celebrated its 100th Anniversary. Considering Bishop and LaRouche started the firm, its probably been in existence for over 150 years…..but whose counting!